Email has become the new mail. In earlier times, we would run to the mailbox as soon as we saw the mailman leave each day, just to see if we got a letter. Today, we tend to check our email every time the cellphone chirps out a notification, or our computers pop up to remind us. It feels as if we can never get away from it. Add to the constant pinging of incoming email the fact that, once received, we have to deal with it. The email inbox has become the pile of junk mail on the dining room table or kitchen counter. Admit it - you have that one place in your house where all the "snail mail" goes when you walk in the door and it may or may not be dealt with within the next year. As a business owner, you're getting more email than you did before you decided to start your company. You're getting hit from all sides - customers, prospects, employees, vendors, sales people - it never ends. That doesn't even count the junk email you get every day into your personal inbox. 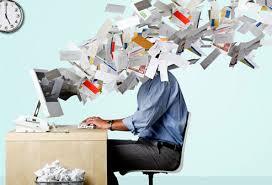 The average person has three different email accounts; that's just an average. Is it possible to control all that information bombarding you every day? It is! In my book, "Help! My Email Is Ruling My Life!" I outline steps you can take to not only get your email under control, but to keep it there. Stop saving emails "just in case." Everyone who ever appeared on the show, "Hoarders," says they keep things just in case they might need it at some point. The rest of your day, only look at your email every 30 minutes and turn off your notifications. You'll be amazed at how quickly your day goes and you'll get more done. I did an interesting study on how badly email is out of control and how quickly it can be brought back to manageable. Download my free white paper, "How To Slay The Email Dragon," here.